by Madigan, Michael T., Clark, David P., Martinko, John M.
Comments: ALTERNATE EDITION: New instructor's edition, same as student edition. It may not include access codes, CDs and other supplements. Is ready for quick shipment anywhere in the US. Comments: Book shows more wear and tear than a good book. Book is warped due to poor storage Cover art may differ from stock photo. Madigan, Michael T., Clark, David P., Martinko, John M.
Science students from any discipline will appreciate this engaging book, not just the biology majors. It sets out the huge subject in a clear and accessible style drawing the reader in from page one. The exceptional images and illustrations are one of the star attractions of this book and add value to the learning experience. World class research is used to lay down the key concepts of microbiology. Students will build on this study with the extra study tools and thought provoking passages throughout the book. Buy cheap biology textbooks from our extensive list and be on top of your science studies. 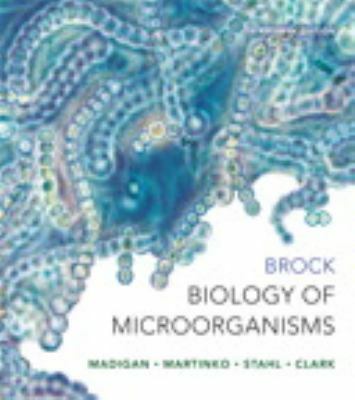 Madigan, Michael T. is the author of 'Brock Biology of Microorganisms (13th Edition)', published 2011 under ISBN 9780321649638 and ISBN 032164963X. Loading marketplace prices 43 copies from $5.60 How does the rental process work?